[social_warfare] December always brings a lot of reflection about the year and this year has definitely followed that trend. Maybe even moreso since I had a big birthday and celebrated a month of memories. Here on the blog, I have a tradition of looking back at the past year — some of the things that readers found more interesting, some of the things I should consider doing, etc. Cotton always stands out for me and I love it when it stands out for you too so here are the top 10 cotton blog posts of 2015! As I looked at the stats on my site, I was blown away by how many of the posts I’ve written about cotton over the years continue to do well. So although I will write another post about some of the other things that stand out on the blog this year, I wanted to devote this post to cotton content specifically. So what posts about cotton are getting read? Let’s start with number 10. This post in the Cotton 101 series describes How a Cotton Gin Works. It is a process that a lot of us learned about in elementary school as we studied Eli Whitney and other inventors. And although the process is similar today, the speed and technology definitely set it apart! Do you know what states grow the most cotton? Well, it seems not many people do! People seem to have an interest in which states produce the most cotton. That’s why this post that covers acres, pounds & more looks at the 2014 data from a few perspectives. I will be updating it for 2015 figures once the year-end report is available. 8. What’s the Fabric of our Lives About? Why Advertise Cotton? One of the most recognizable brands in the US is the seal of cotton — that emblem that not only is on t-shirts, sheets and other cotton goods but holds my business card on my luggage. That seal is part of the program that advertises cotton under the Fabric of our Lives. 7. What’s with that Hayden Panettiere cotton commercial? Given the interest in advertising cotton, it seems logical that more people would be interested in the cotton commercial that features Nashville star Hayden Panettiere. This post explains what is behind the commercial and lets you see one of the ads. 6. Cotton 101: Can you eat cotton or cottonseed? The role of oilseeds in our diets for cooking, generating oils or meal for other food uses leads some people to ask whether you can eat cotton or cottonseed. This post highlights how cottonseed is used for oils and livestock and the potential for cottonseed being used in human diets. 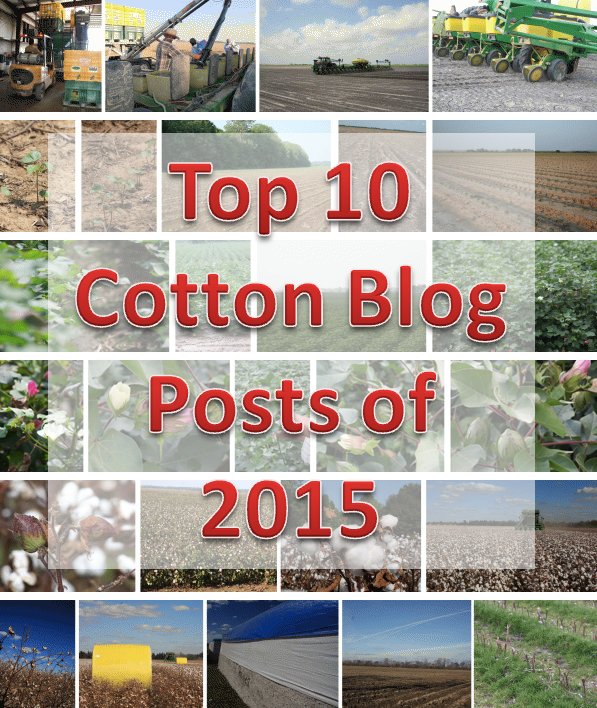 The pattern of several Cotton 101 posts being in the top posts of 2015 is clear. I started the series a long time ago and use it as a place to connect to some of the timeless, more general information about my favorite fiber. This is a page not a post so I really considered pulling it from the list, but hey, my blog, my rules so I decided to put it here as a disruptor! LOL. Walking around a cotton field isn’t something everyone gets to do. One of my early posts that still gets a lot of traffic (it’s in the top 3 this year!) is a photo post that I later thought could possibly be more engaging to folks if I did it in video form. This post (video and copy) shows what a cotton plant, blooms & bolls look like. I am still impressed with how pretty the flowers and bolls are! 4. How is cotton picked nowadays? Picking cotton has been immortalized in song by Johnny Cash and lots of others. We study in history books about the back-breaking work that picking cotton was. But in today’s world, not a lot of people have ever seen cotton in the field, much less have they witnessed harvest! Looking at the ways is cotton picked nowadays, there are a few ways it is done, but the US, Australia & Brazil rely on big machinery! 3. Cotton 101: What does a cotton plant or field look like? This is the photo-oriented post I mentioned previously that shares what a cotton plant or field look likes at various times of year. For someone who has worked with cotton farmers for decades, this was a post that I may never have thought to pull photos together for if it weren’t for a friend on a road trip asking me what he was seeing. I decided to go beyond his question to the question people coud ask anytime of year. It took work to get all the pics together (and now I have done the master montage at left!) but I am amazed at how much of a resource it has become! Most of us don’t think about the little things we come in contact with day in and day out. Heck we can’t! It is something that will overload our minds! But there are some little things that folks may find interesting about cotton, that may peak their interest for a bit. That what this post about the crop & cotton products offers. What should be written in 2016? Having looked at the top 10 cotton blog posts of 2015, and thinking cotton thoughts, feel free to let me know what you think should be put on the to write list. I have a couple of ideas based on some questions I have gotten through Twitter & email, but I’d love to know what questions you have too!